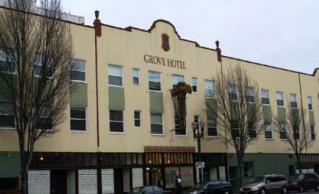 This historic Portland landmark served as a low-income residential hotel since it was built in 1907. One hundred years later, Home Forward completed a renovation that brought it up to code and returned it to safe and decent service. After construction, Central City Concern began leasing The Grove for their Housing Rapid Response Program. The program housed chronically homeless offenders leaving the jail system and provided them with intense case management and peer mentors, as well as mental health care, addiction treatment, and other support. As part of the original agreement, Home Forward sold the property back to the Portland Development Commission, which has been pursuing redevelopment for the downtown building. During renovation, units were restored with new sinks, added storage, paint, windows, sprinkler system and flooring. 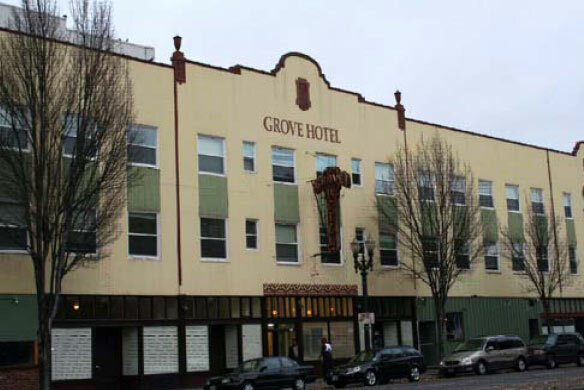 The acquisition and renovation were completed under an accelerated schedule on behalf of our jurisdictional partner, the City of Portland, in order to address serious code violations and safety concerns for the former residents. Of the 130 units constructed at Bud Clark Commons, 70 units are considered “replacement units” for The Grove in compliance with the City’s policy of “no net loss” of low income housing in the central city.